Yang Luchan, the founder of Yang Style Taijiquan was born in 1799 in Yongnian County in Hebei province China. At the age of 10 he moved to Chenjiagou in Henan province where he worked as a servant for the Chen family, the originators of taijquan (tai chi chuan). Legend has it that as Yang was not a Chen family member he would not be allowed to learn their family art so he was reputed to have concealed himself during their training sessions so he could acquire their fighting skills. Later, it is claimed, that because he used what he had learned and practiced in secret to defend against robber who came to their village when all of the Chen men were working in the fields. Seeing he has more than adept and no doubt a keen student, Yang was subsequently encouraged to learn their unique fighting system. Some time later Yang Luchan moved to Beijing, on the recommendation of an Imperial Councilor, where he taught tai chi to the Imperial Guard. If not for this move to Beijing and Yang’s promotion of the art there, it is very likely that tai chi chuan would have never gotten beyond the small village of Chenjiagou and may well have subsequently died there. As the Yang style system increased in popularity more and more people wanted to learn it. Because of this Yang Luchan gradually removed the more demanding jumps, leaps and explosive movements, making it more accessible to the masses. The third son, Yang Jianhou (1839 – 1917) amended the family system further to become known as Medium Frame form and the third son of Yang Jianhou, Yang Chengfu 1883 – 1936) finally created the now popular Big Frame form which included larger, wider, more expansive movements. 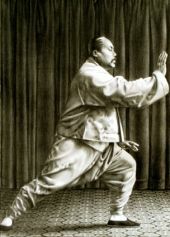 Nowadays the Yang Style School of Taijiquan traditionally has three ‘frame’ forms, High, Medium and Low. Modern day inheritors of this family system are Yang Zhenduo who was born in 1926, Yang Zhen Guo, 1929 and Yang Jun, the 6th generation descendant who was born in 1968.